US crude oil inventories: The API is set to release its weekly inventory numbers later today, and expectations are that US crude oil inventories increased by around 2.4MMbbls, according to a Bloomberg survey. The market also expects a 1.17MMbbls build in gasoline inventories and a draw of 1.67MMMbbls in distillate fuel oil stocks. The EIA is also scheduled to publish its latest Short Term Energy Outlook today. In last month’s report, it forecast 2019 and 2020 US oil output to average 12.1MMbbls/d and 12.9MMbbls/d, respectively. OPEC will also release its monthly oil market report today. WTI spread weakness: Prompt WTI spreads remain weak, suggesting comfortable supply in the spot market. 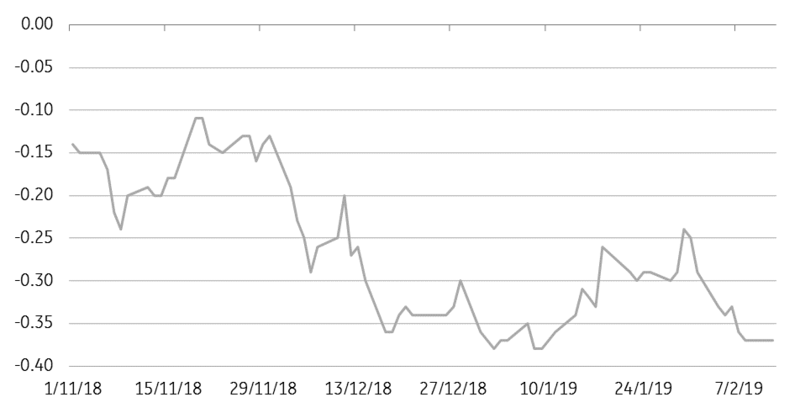 The WTI Mar/Apr spread is trading at a discount of US$0.38/bbl at the moment, whilst the Apr/May spread is trading at a discount of US$0.53/bbl. In comparison, the front end of the Brent curve appears better supported, with the Brent Apr/May spread largely flat. The diverging trend between the two does appear to reflect a relatively more bearish prompt market for WTI, with expectations of further crude builds and reduced refinery run rates. The WTI/Brent is currently trading at a discount of US$8.80/bbl, compared to around a discount of less than US$7/bbl at the start of the month. Gold demand: Media reports suggest that Indian gold imports increased by 64% year-on-year to 46 tonnes in January 2019, as consumers increased gold purchases ahead of the wedding season. 2018 was a relatively dull year for India’s gold demand, with imports falling 20% YoY to 762 tonnes. However, 2019 could be a better year for gold imports on higher government spending ahead of general elections and monetary easing by the Reserve Bank of India. In China, the central bank increased its gold holdings for the second consecutive month, with total holdings now standing at 59.94mOz, up 380kOz month-on-month. USD weighs on the complex: The USD index has appreciated by 1.6% since the start of the month, which has weighed on both the base and precious metals complex. The Bloomberg precious metals index has fallen 1.3% MTD, while the LME index is down 1.1%. Strong US jobs numbers at the start of the month, along with uncertainty over whether China and the US will come to a trade deal ahead of the deadline at the end of this month have been supportive for the US dollar. USDA export inspections: Latest data from the USDA shows that 1.06mt of US soybeans were inspected over the last week for export, this compares to 1.34mt for the same week last year. Year-to-date inspections total 22.63mt, which is still lagging significantly the 36.05mt inspected at the same stage last year. 487kt of soybeans inspected over the last week were destined for China. Meanwhile, corn export inspections over the week totalled 744kt, down from the 847kt for the same week last year. Cumulative inspections so far this marketing year total 23.21mt, compared to 15.74mt at the same stage last year.